Roasting beef on the gas grill adds a wonderful smoky flavor to roast. Searing the outside of the roast with high heat to create a tasty crust, then slowly cooking it using indirect heat, ensures a delicious, tender and juicy result, everytime. Normally, you'll get a smoky flavor when fat from the meat drips onto the hot rocks above the burners, but when you use indirect heat for large cuts, the rocks aren't as hot and you get less smoke. Solution? Add soaked wood chips to your grill to ensure a smokier result. Take the roast out of the refrigerator 60 minutes before grilling time. This allows the roast to warm to room temperature. Soak two cups of wood chips in cool water for 15 minutes. Drain the chips and put them in a metal wood chip box, available where grills are sold. Conversely, you can make your own wood chip box using heavy duty aluminum foil, folding it to make a 6-inch square box. Seal the box using aluminum foil. Punch holes in the lid with a fork to allow smoke to escape. Preheat the gas grill to medium high for at least 15 minutes, with the lid closed. Pat the roast dry using paper towels. Rub the entire surface of the roast with salt and fresh ground pepper and any other dry seasons you wish. Right before you grill the roast, rub the entire roast, including nooks and crannies, with oil. Scrape the grill clean with a grill brush and rub oil on the grill using paper towels. Place the wood chips near the hottest part of the grill, allowing room for the roast. Put the roast on the center of the grill and sear all sides for two minutes per side. Avoid poking holes in the roast as you turn it, as this promotes loss of juice. Close the grill lid during the searing, opening it briefly only to turn the roast. Turn the main burner down to medium and turn the other burners off. Move the roast to a cooler part of the grill, fat side up. Move the wood chips directly over the burner. Push an instant read meat thermometer into the roast so the tip is in the middle of the roast, away from any bones. Put an oven thermometer, if you have one, on the grill near the roast. Close the lid and cook the roast about 15 minutes per pound, or until the meat thermometer reads 120 to 125 degrees for medium rare. Transfer the roast from the grill to a plate. Cover it loosely with aluminum foil and let it rest for 15 minutes before carving. Slice tougher roasts into thin slices. 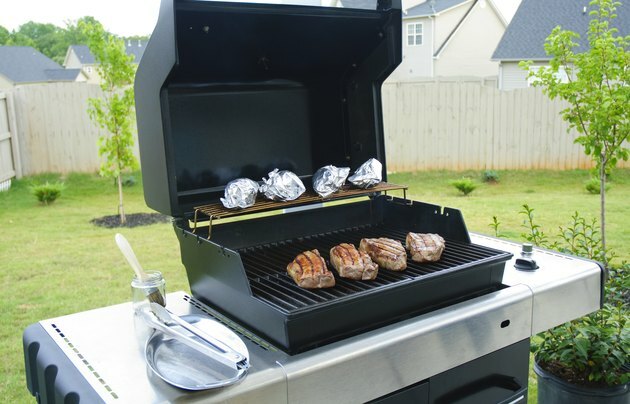 Strive to set the grill’s cooking temperature to around 250 degrees. This creates the tastiest and most evenly cooked roast. To ensure tenderness, don’t cook the meat beyond medium rare. Cut off slices and grill them for a minute or so per side for those who like their meat medium or well-done. The Reluctant Gourmet: Do You Know When Your Meat is Medium-Rare?